The blueprint is the end state. The roadmap shows changes to the product over time, focusing on major milestones, which will often align with system releases. The roadmap provides the opportunity to articulate the solution at different states in it’s lifecycle. An example may include a data entry screen being built with no validations, and then a later release with field or data validations being introduced. Maybe the back office user data entry process will get decommissioned and replaced with a web based customer data entry process. 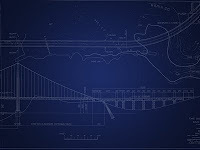 A blueprint is the idea of a defined product via a set of requirements and/or features. It shows an ‘end-state’ for a product. The blueprint is fine of you are only targeting a project with one major release, but that is likely to be the exception rather than the rule these days. BAs who are working on projects with multiple releases (or iterations) should be working to parcel their requirements into these product milestones. Adopting the agile philosophy of early value through many releases you also get the idea of ‘value management’ embedded into your requirements management process.